If you watch 3-Gun Nation of participate in any IPSC, USPSA you have definitely seen an STI in action. 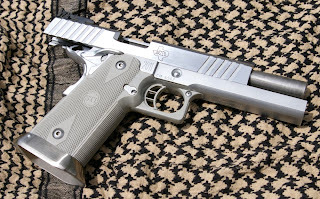 1911’s have been upgraded since their inception and has became one of the most customized guns in history. One thing was certain, 1911s were not going away and people were screaming for factory ready-to-compete pistols. 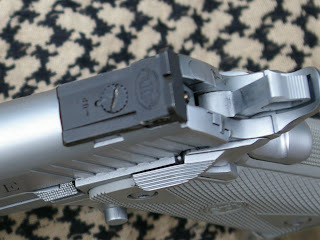 STI was founded in the 1980s designing and developing the parts and pieces used in hopping up 1911s. STI is one of the oldest competition 1911 brands and over time they offered more and more parts until they began offering complete pistols. Today STI makes a wide variety of world class competition leading production semi-custom 1911s to choose from chambered in 9mm, .38 Super, .357 Sig, .40 S&W, 10mm, and 45 ACP. STI’s Semi-custom pistols are in most cases significantly less expensive than complete gunsmith upgraded and customized 1911 pistols. One of the things I like about STI is that they are 100% employee owned which means everyone works as an owner to assure everything from product to customer service is top notch. What you get from an STI gun is a semi-custom gun in a production format and price point that is ready to compete professionally out of the box. They do offer custom work, however their focus is to provide high quality, semi-custom 1911 pistols at production prices and volumes. My friends at STI supplied me with the new STI Executive 1911 in .40 S&W for testing before the gun returns to STI to be showcased at the Shot Show. The STI Executive is based on the legendary STI Edge model and built on the patented modular steel frame with polymer grip, but the main attraction beyond the features provided by the Edge design is the high capacity magazine of the Executive with 14-22 round capacity. 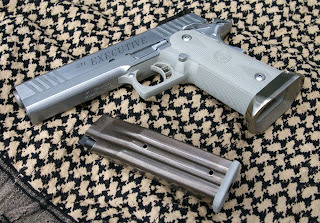 The STI Executive is definitely a complete re-engineered rebuild of the 1911 and is far and away a different animal from a standard 1911 pistol with a few upgraded parts. The end result is something more comfortable, more shoot-able, and something way more accurate. If you are un-familiar with STI you will be stunned at the quality, fit, trigger, and features which is leagues ahead of anything in the production market. The finish on any of the STI pistols is exceptional. 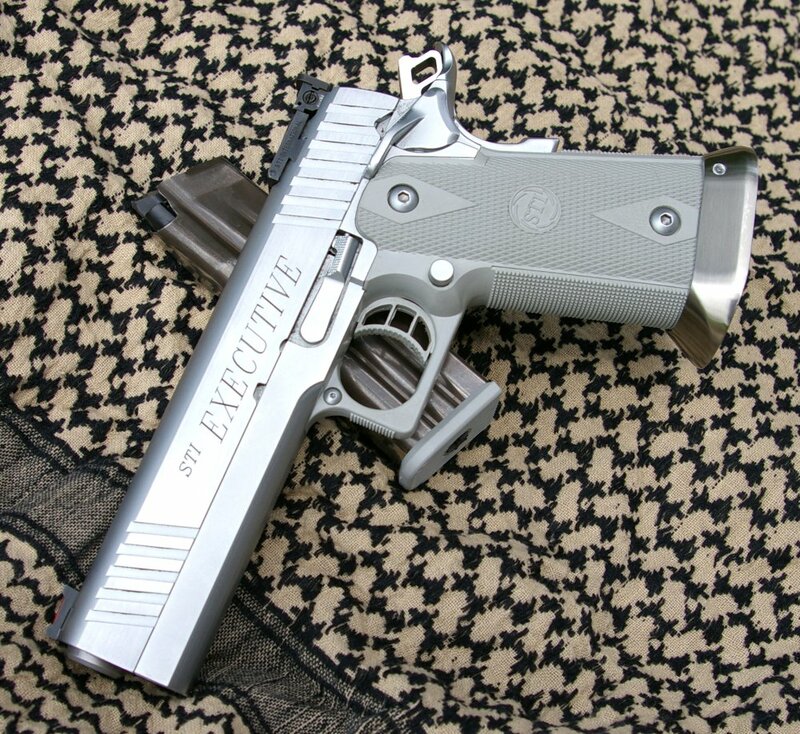 In the case of the STI Executive, it is completely hard chromed which increases the weather resistance, but also provides for a stunning looking gun. One of the most noticeable features is the fit which is superior to any production gun you will ever handle and fire. 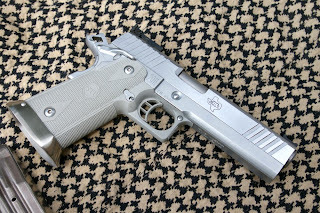 This fit and the hard chrome finish results in one of the most smooth cycling 1911 actions you will experience in any gun outside of a fully custom 1911. Despite being loaded with a 126mm STI magazine full of 14-rounds of .40 rounds, the gun feel quick in the hand and points and transition easily form target to target. 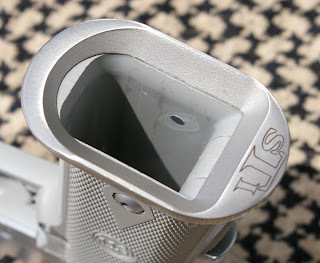 The STI Executive will also accept 140mm and 170mm magazines for 17 and 22 round capacity. There are no odd radius or other sharp points and with the STI Modular High Capacity Wide frame on the Executive actually feels no wider than a standard single stock 1911 in my stumpy little hands. 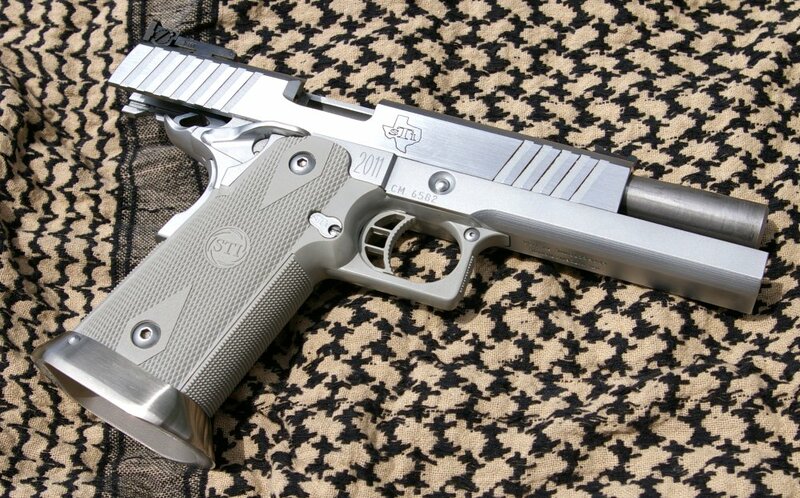 Many folks will be surprised that the STI Executive feels like a standard single stack 1911. Loaded into the STI Executive is a full array of upgrades. The STI Executive has a unique exclusive full length slide with front and rear cocking serrations, Dawson fiber optic (.100) front sights allow for quicker target acquisition, and of course STI’s own adjustable rear sight serves up precision sighting on the rear. Other standard features include a stainless steel STI knuckle relief hi-ride grip safety, stainless steel STI ambi-thumb safeties, and an STI 5” stainless steel fully supported ramped match bull barrel. 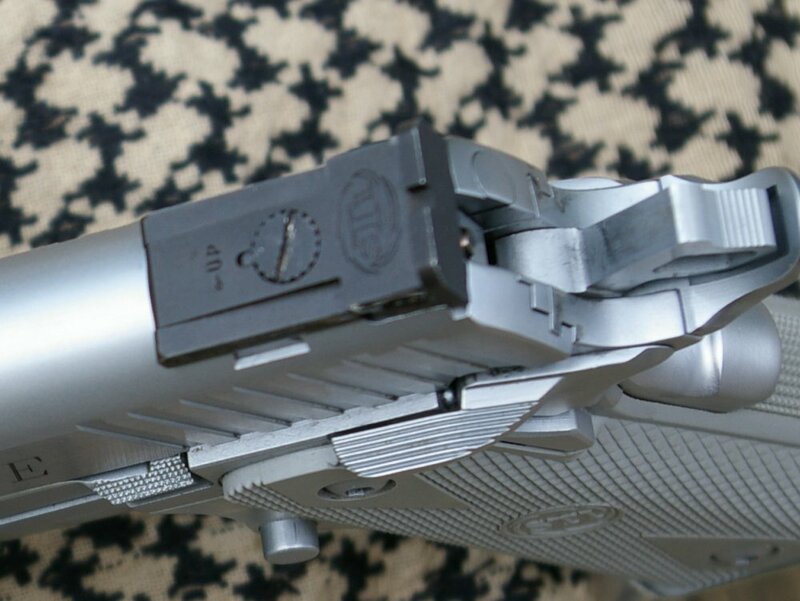 STI’s proprietary modular polymer grip retains 17° angle of gripe to slide, provides for high capacity double stack magazines all with a grip comparatively the same as a standard 1911. Even in my stumpy hands this was still a relatively slim grip profile. Other extras are STI RecoilMaster guide rod, magazine funnel, and curved gray composite trigger. Despite all these upgrades the STI Executive is still IPSC and USPSA competition approved. 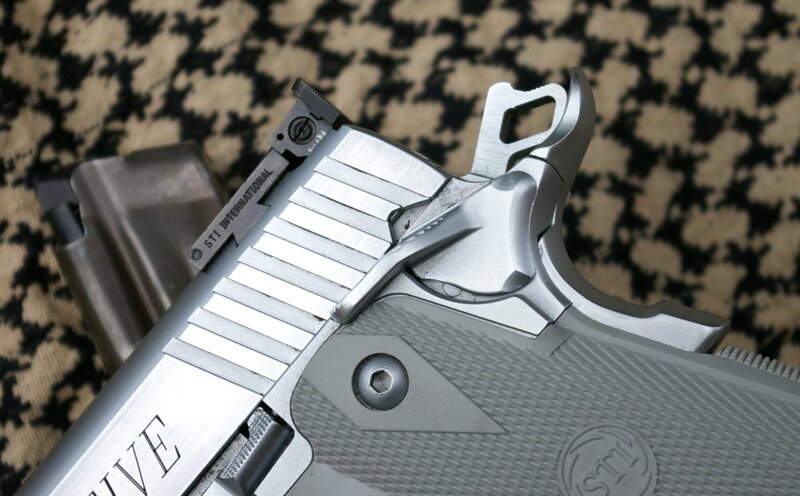 STI parts and complete pistols has a long standing reputation for reliability and the Executive is no exception. Although I only had an opportunity to run around 300 rounds through this 1911, I experienced absolutely no feeding or functioning issues with a variety of inexpensive to top end ammunition. From a operation perspective, all the controls were typical 1911 style, all be it significantly more refined and much more user friendly to get you on target faster. As expected the STI Executive was a tack driver even under fast firing conditions. Where convenient, I find that accuracy is best graded when off hand higher round count groups are tested and as shown a full 14-round group netted a the pictured 25-yard off hand group. 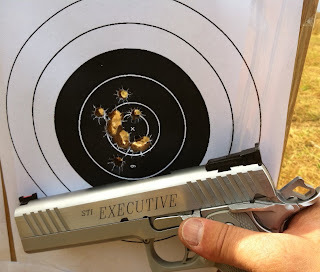 Some of my best 25 yard 5-round groups were under .8” and keeping all the bullets in a nice tight 5 shot groups around 1” off the rest was a pretty simple affair with most ammo. This gun is an outstanding shooter and was very consistent across many ammo brands and bullet weights and I did not find anything that did not shoot well from steel case to match grade ammo. 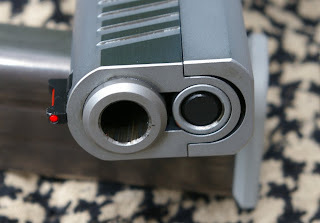 In any gun you can always find that one round that shoots drastically tighter groups than any other, however for me the STI Executive’s ammo indifferent accuracy indicates a very accurate gun. Why a $2400 1911? If you are serious about competing or an accuracy nut you will spend that money one way or another in upgrades, replacement parts, and gunsmithing on a stock 1911 and still miss the STI Executive’s performance by a significant margin. Every 1911 shooter I have talked with will always recommend buying the 1911 at the level you want it to perform as upgrades add up quickly. High end match grade single stack 1911 pistols are easily in the $1500-$2000 price range and they still will not be able to offer the upgraded 1911 design capabilities of the STI frame, slide, barrel, and parts which maximize reliability and accuracy. Add in the fact you have 14-22 round high capacity magazine compatibility and STI become a smart choice for the competitive or defensive shooter who needs more than just 8 shots. 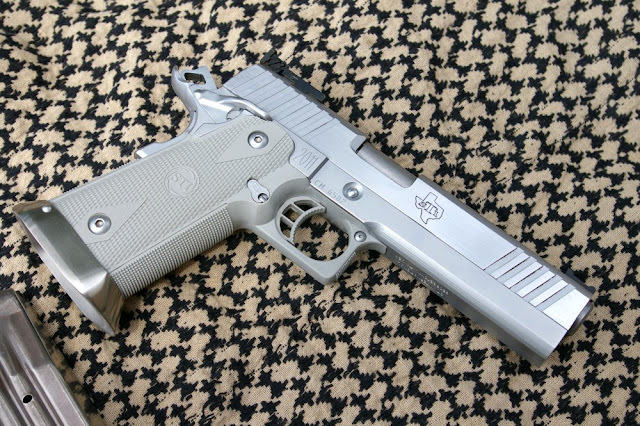 Another reason to look at the STI Executive is its .40 S&W chambering which is one of the few .40 1911 on the market. The .40 S&W round has become “the” hot round for competitive shooting because of recoil and lower ammo cost and at the peak of the ammo shortage a justification could be made that a .40 pistol could pay for itself in ammo savings, however today we are back to a $4-$6 difference in prices between the .40 and .45 ammo, however after a few thousand rounds that savings will still add up. The STI Executive’s hard chrome finish makes for a stunning looking gun and the features makes the gun a true joy to shoot easily, quickly and well. 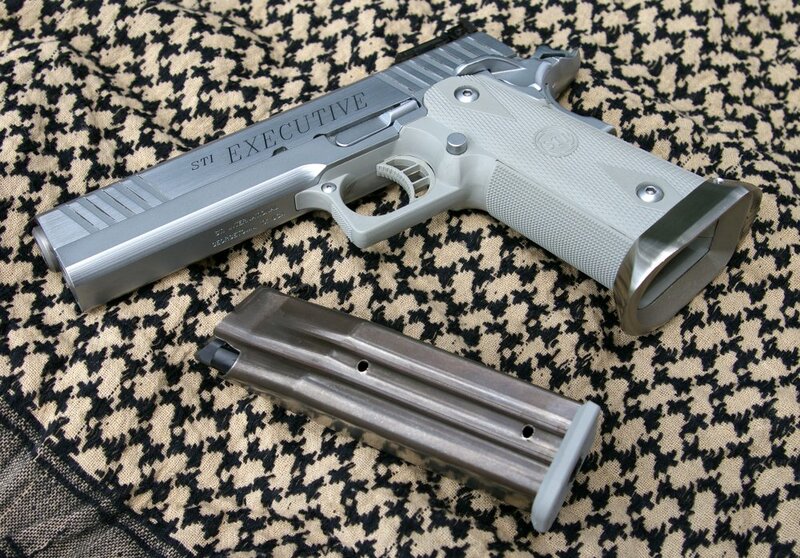 The name of Executive is perfect as I can see the practiced 1911 CCW permit holders packing this as their every day carry gun for dependable high accuracy defense. For those that make it to this year’s shot show I hope you have an opportunity to handle this truly spectacular firearm.